I sadly ran out of my MAC eye brow pencil (devastated) and i didn't really know what to do with my self as it was the only one i had ever bought and i wasn't really sure what classed as a good one..
i wanted to re-buy the MAC one but i thought why not try out a cheaper one too so that i can possibly use a cheaper one for everyday (work etc) and then a nicer one for nights out ect. I decided on this Rimmel professional eyebrow pencil in the shade Hazel 002. I feel it was harder deciding on a shade when there is no one to match it up perfectly for you but i thought id try this one out as it only cost £2.99 and you get the small eyebrow brush on the lid that is actually quiet handy ! The shade matches me quiet well but i do feel its a bit scary when i first put it on along with my makeup but once my hair is done and im all ready it looks natural. I glad i bought a pencil you have to sharpen rather than a twist one like the MAC one, as i now know how much i have left to use and obviously it lasts for a Long time ! 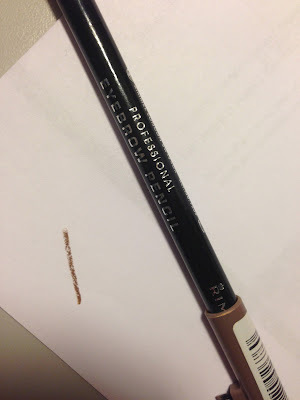 The pencil goes on really well and i usually use the little brush before and after application or use one of my own bigger brushes.